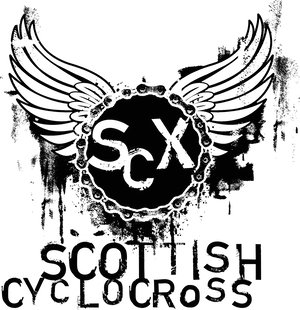 The Tri Centre Scottish Cyclocross Series for 2011 is only a few weeks away and Walkers Cycling Club, promoters of the first round of the series on Sunday 2nd October have been in touch with information on the event. Car Parking and race HQ will be at the “Dragon Car Park” on Marine Drive, and not where the map on the BC Website shows (that is just the only identifiable postcode locally). The race HQ will be signposted from the Magnum roundabout. There is ample car parking space at the race HQ, but please be aware that there will be other users of the beachpark, so please park considerately to make sure there is room for everyone. There will be toilets at the HQ. Changing facilities and showers are available at the Magnum Leisure Centre (5 minutes ride from the race HQ) for a small cost. Registration will close 30 minutes before each race. The volunteers at registration will be prioritising the riders according to how soon their race is, so please bear this in mind. A catering van will be coming to the race, so hot and cold drinks and snacks will be available. This event could not happen without the hard work of the members of Walkers Cycling Club, and the support of North Ayrshire Council. There is a separate course for U12 riders, which will be mostly on grass and gravel path, with passing possible on the bulk of the course. This course is centred round the race HQ area next to the car park. You must not practice on the course without having signed on, and without your number. The main course is a mixture of gravel paths, grass, moorland singletrack and of course, sand. We can almost guarantee that there will be no mud! The beachpark is popular with families, dog walkers and horse riders, and whilst the course will be double taped where possible, and crossing points marshalled, please be aware of other users when practicing and racing. 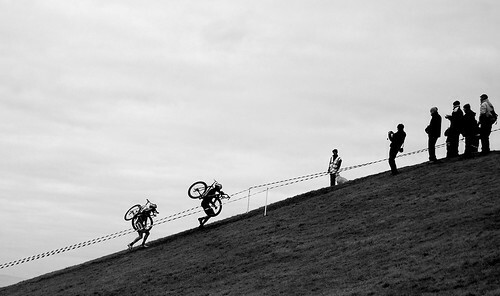 There will be no practice until all racing riders have all left the course. It is our intention to start on the beach again this year, if the tides allow, with a 300-400m loop on hard sand, before climbing the sand-dune and joining the course proper. 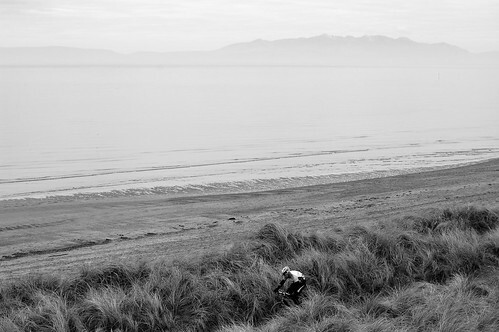 If the conditions on the beach, or the dunes do not allow this, we will start on the grass as with the Scottish Championships in January. The lack of trees/undergrowth and the compact nature of the course makes it great for spectating, with 75% of the course visible from the higher vantage points in the park, so please bring supporters, encourage friends and club mates to come and support you, and other competitors. Given the seaside nature of the venue, and the time of year, the beachpark can be a cold, exposed place, so please bring plenty of warm clothes for yourself & your helpers/supporters. Hi, there will be U8, U10 and U12 categories all starting together under the banner of the U12's race.